Arrive in New Delhi, the bustling capital of India and transfer to our comfortable hotel in the city. Delhi is slowly becoming the largest city in India rapidly catching up to Mumbai (Bombay) and Kolkata (Calcutta). In addition, Delhi has long since eclipsed them in political importance. In some areas it remains a spacious garden city, tree-lined with beautiful parks, but it can also be crowded and raucous. Turbaned Sikhs, colorfully dressed Rajasthani and Gujarati women working as manual laborers on building sites and the shopkeepers along Janpath Road all add to the cosmopolitan feel of the city. The rest of the day is free to relax or to explore. 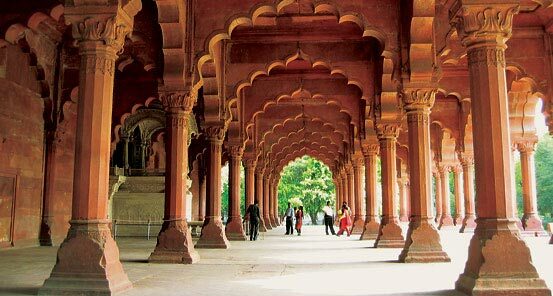 We spend the day in Delhi, exploring some of the sights in both the "Old" and the "New" cities. In Old Delhi, we visit the Jama Masjid - India's largest Mosque; and also enjoy a rickshaw ride through Chandi Chowk, Delhi's famous "Silver Street". In New Delhi, we see the Qutab Minar, Gandhi's tomb; see India Gate - the "Arc de Triomphe" that leads to the Indian Parliament, which we will drive through. 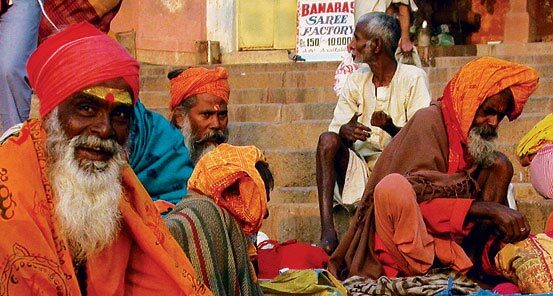 We depart Delhi by plane to the "Eternal City" of Varanasi, also known as Benares. The city lies on the west bank of the Ganges at a point where it sweeps in a great bend north before resuming its southeasterly course to the sea. India's most sacred city, it was already an important town in the 7th century BC when Babylon was at the peak of its power and was certainly well established by the time Buddha arrived here in 500 BC. Varanasi is said to combine the virtues of all other places of pilgrimage and anyone dying within the area is transported straight to heaven. This is why many devout Hindus move to Varanasi to end their days and have their ashes scattered in the holy Ganges. We journey to our hotel to prepare for our evening experience starting with a rickshaw ride to visit a ghat at aarti (prayer) time. An early morning boat trip on the Ganges River takes us past the ghats where pilgrims have come to purify themselves and where bathing and cremations are regular activities in these sacred waters. After the boat trip we visit Sarnath, the ancient site where Buddha gave his first sermon. Today, the monks are long gone and the buildings are in ruin but its setting among green grass and beautiful trees makes it an ideal place to experience India's profound past. Tonight we take a boat ride for a special ceremony with traditional music along the Ganges River. In the morning, we take a short flight to Khajuraho, a medieval city filled with intriguing temples. In the afternoon we explore Khajuraho's temples (declared a UNESCO World Heritage Site). Intricately carved, these ancient temples depict human and divine forms engaged in daily life. This morning we depart to Orchha arriving in time for our cooking class in a local home. We have the opportunity to learn how to prepare local Indian dishes as well as enjoy a sumptuous feast with our hosts. This will be much more than a cooking lesson as you get a first-hand glimpse into Indian life as you interact with a family in their home. After lunch we say goodbye to our hosts and explore the temples of Orchha. In the evening we will see these ancient temples come alive with the brilliant lights that make them shine. In the morning, we visit the Amermahal Palace, which resembles a European-style castle. In the afternoon we drive to Jhansi where we board the train for Agra, home to the Taj Mahal. Upon our arrival in Agra, we check into the hotel for dinner. 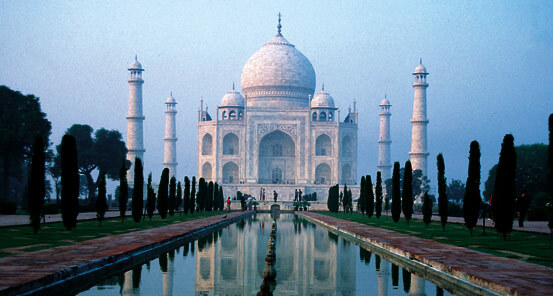 We have a full day to explore some of the most famous sights of Agra, including the Taj Mahal (UNESCO). This white marbled jewel was built over a 22-year period by Shah Jehan as a monument to his great love for his wife. We also visit Agra Fort (UNESCO) built by Akbar the Great, which includes the Pearl Mosque, the Palace and the Halls of Private and Public Audience. Later, we visit the Itmad-Ud-Daulah Tomb, which was also known as the mini Taj Mahal. We will learn why this tomb pre-dates the Taj Mahal as we marvel in the lace design that makes this tomb so unique. In 1612, Arjumand Banu Begam, better known by her other name, Mumtaz Mahal was married to Shah Jehan (then Prince Khurram), the fifth Mughal Emperor. This marriage, although the emperor's second, was a real love-match, and Mumtaz was her husband's inseparable companion on all his journeys and military expeditions. She was his comrade, his counselor, and inspired him to acts of charity and benevolence towards the weak and the needy. She bore him fourteen children, and died in childbirth in 1630 (only three years after his accession to the throne) in Burhanpur in the Deccan Plateau where she had accompanied him on a military campaign. Overpowered by grief, Shah Jehan was determined to perpetuate her memory for immortality, and decided to build his beloved wife the finest sepulchre ever - a monument of eternal love. It was Shah Jehan's everlasting love for Mumtaz that led to the genesis of the Taj Mahal. The sad circumstances, which attended the early death of the empress who had endeared herself to the people, inspired all his subjects to join in the emperor's pious intentions. After twenty-two laborious years, and the combined effort of over twenty thousand workmen and master craftsmen, the complex was finally completed in 1648 on the banks on the river Yamuna in Agra, the capital of Mughal monarchs. In the morning we depart Agra and journey to the Bharatpur Bird Sanctuary, stopping enroute to visit the ancient ghost town of Fatehpur Sikri, and wander amongst its beautiful stone buildings set in the desert. Onward, we arrive at our resort where you will have some free time to relax. In the late afternoon when the birds are at their best we will take a rickshaw into the Bharatpur Bird Sanctuary (UNESCO) to learn about the beautiful bird life in this wonderful park. The sanctuary is a 20 sq. mile marshland, reputed to be one of the best bird sanctuaries in the world - over 360 bird species have been recorded here. We depart Bharatpur for Ranthambhore. We arrive in time for lunch followed by an afternoon visit to the Ranthambhore Fort. Be sure to have your cameras ready as the Fort is set inside the park and you never know when you will see a tiger, bear or any wildlife. We spend the day in this park, which is famous for its tiger population. Here we learn about these elusive creatures as we travel by open vehicle. There are two safaris: one in the early morning and one in the late afternoon. The chances of seeing a tiger in the wild are small, but it provides a great opportunity to learn about them and to take in the beauty of the park at the same time. 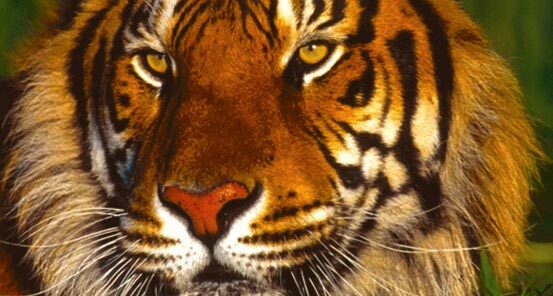 Other wildlife includes deer, crocodiles, Asian Sun Bears, leopards, monkeys and a wide variety of birds. In the morning we depart Ranthambhore for Jaipur, the "Pink City" of Rajasthan, which was built in 1728 and holds many attractions for the modern-day traveler. It earned its moniker as the Pink City because the rock that was used in the city's construction has a pink hue. Enjoy a relaxing evening in the Pink City or for those who want to learn more about the famous Bollywood, we will attend a true Hindi Bollywood movie at one of the oldest and most extraordinary cinemas in Jaipur. In the morning we visit Amber Palace and Fort with it's impressive architechural style, perched on a hill overlooking Maoto lake. We stop at the Hawa Mahal (Palace of the Winds) to catch the morning sun on this beautiful structure. We will explore this majestic fort and learn the history of Jaipur and how life was like in the king's day. In the afternoon we will journey to the famous Jantar Mantar the largest stone astronomical observatory built by Maharaja Jai Singh (UNESCO). We will also visit the City Palace. In the afternoon we will end our sightseeing with some free time to wander the colorful markets of Jaipur or take a rickshaw ride through the old city. Today, we travel overland to the idyllic desert town of Pushkar. Situated on the edge of the Thar Desert in Rajasthan, the town of Pushkar is a peaceful oasis where travelers escape the bustle of big city India - to a place frozen in the ancient ways of an India from the past. Arriving in the afternoon you have free time to sit by the lake and watch the pious perform their ablutions in the holy waters, or explore this fascinating town as troops of monkeys perform their antics around you. We have planned our fall departures around one of India's largest festivals, the Pushkar Camel Festival. Pushkar is an oasis in the desert and is a special place in its own right. Every year Pushkar becomes a world-class spectacle during the Camel Festival, whose dates are timed with the lunar calendar. For centuries, traders have been coming to this event to buy, sell and trade oxen, cattle, mules and even elephants, but it is camels who hold center stage at Pushkar. It is estimated that up to 50,000 camels are bought, sold and traded every year at the Camel Fair. Overnight, Pushkar is transformed. Devotees, traders, musicians and jugglers flock to the town. Pushkar bursts with color, people and gaiety during the week of the autumn full moon. Held for five days and culminating on the auspicious Purnima (full moon of the Hindu month of Kartik), the Pushkar Camel Fair is one of India's greatest festivals. Today we will get up early to walk around the fair grounds and watch the trading of livestock in action. Talk to the farmers and learn where they travelled from to sell or trade their camels. Get up and personal with the camels and learn about these fascinating creatures. Make sure your camera is ready at all times as the colorful decorations and amazing designs that the camels show off are truly something you will want to capture. We will watch the day's competitions and street theater and walk amongst the variety of vendors selling interesting handicrafts. In the evening we will take a camel safari to watch the sunset over the fair grounds and the desert. Today we depart Pushkar for Jodhpur. Once the former capital of Marwar State, Jodhpur was founded in 1459 by Rao Jodha, who himself claimed descent from Lord Rama (the hero of the epic Ramayana). The massive fort - Mehrangarh - came first and around it grew the city of Jodhpur protected by a high stone wall with its seven gates and countless bastions. Today, the city has grown to become the second largest city of Rajasthan yet still manages to maintain its medieval character. As in the past, Jodhpur remains one of the leading trading centers of wood, cattle, camels, salt and agricultural crops. However, the past is never very far behind and Jodhpur boasts some fine reminders of this glorious past - palaces, forts, temples and other elegant monuments of architectural and historical value. After lunch we will embark on a tour of the fort. Learn about the cast system and the rich history of the region. Take your time at each room, go back to your favorite place or just sit in the peaceful courtyards. We conclude our tour with a stop at the viewing point for a picture of the Jaswant Thada, a royal cenotaph made of white marble. This morning, we visit the villages of Bisnois - a community of nature worshipers. We will be welcomed into a local home to learn about their beliefs and see how they live in this harsh land. We will also visit a traditional carpet-weaving village and learn the art of weaving. We continue our journey to Kumbhalgarh, stopping enroute to see Ranakpur Jain Temple. We arrive in Kumbhalgarh late afternoon and settle into our hotel. After breakfast, depart for Udaipur but first stopping to visit the Khumbal Garh Fort. Udaipur is set in the Girwa Valley amidst the Aravalli Hills of south Rajasthan, Udaipur is a beautiful city - regarded by Indians and foreigners alike as one of the most romantic in India. It is a lovely city to explore with fairy tale white marble palaces, placid blue lakes and green hills that create a feeling of serenity. Udaipur is undoubtedly an oasis of color in an arid region of India. Upon arrival we will have a walking tour of the small streets with some free time. In the evening we will attend a culture show followed by dinner. Today we have a full day of sightseeing with a visit to the City Palace and a local artist studio to see how the famous miniature paintings are created. After lunch we board a small boat for a lake cruise to view this wonderful city from the water, including a view of the famous Lake Palace. After breakfast we are transferred to the airport for our flight to New Delhi. Upon arrival, we are transferred to our hotel before venturing out for a truly remarkable day. We will ride the Delhi Metro system to the spice market and explore the hustle and bustle of this unique market. Afterwards we will take cycle rickshaws through the busy streets of Dehli to the Sikh Temple. Tour the kitchen where massive pots cook the free meals this temple serves on a daily basis. We will return to our cycle rickshaws and travel to a local restaurant where we will have lunch. Our bus will be waiting for us after lunch to take us to our hotel for an afternoon of leisure time before our farewell dinner. Today we say goodbye to this remarkable part of India. You are transferred to the airport for your international departure flight.